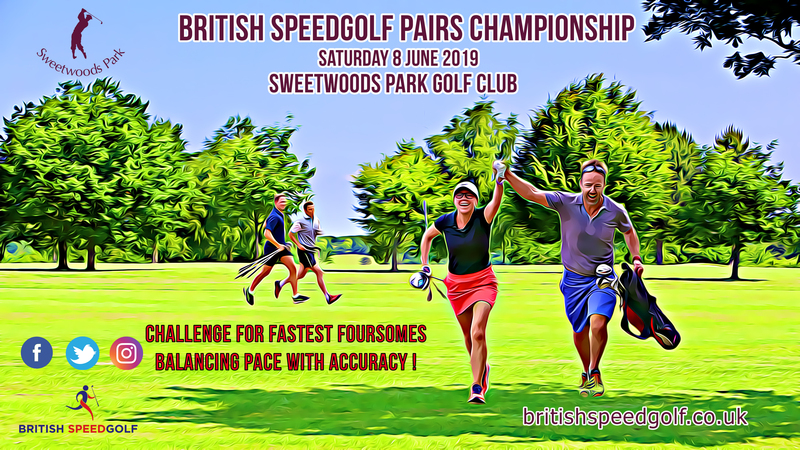 The British Speedgolf Pairs Championships will take place on Saturday 8 June, at the superb Sweetwoods Park Golf club, a parkland course bordering East Sussex, Kent and West Sussex and is located just 16 miles from London Gatwick. Buggies or trolleys are not used by players in Speedgolf tournaments, but scorers will be following each pair in a buggy! View a hole by hole preview of the course. There is no prize purse for the championship; Trophies, medals and bragging rights are the order of the day! There is capacity for just 15 Pairs so ensure you register swiftly to secure your place! Speedgolf Pairs adds a social dimension to the sport and with the foursome format, team work is essential. If you are interested in competing but don’t have a partner, please contact us to match you up with another player. Spectators and supporters are welcome and proceedings should finish around 10.30 am. The club has ample parking, changing rooms and other club facilities. If you have any specific needs please contact us in advance of registering to play to ensure we can accommodate these. Sweetwoods Park have already supported British Speedgolf by running some social Speedgolf sessions last season and this year and welcome new speedgolfers to a weekly Wednesday morning session (8.30 am back 9 holes) which will resume once the weather improves. Make sure you join the Virtual Speeedgolf Café Facebook group which is where we will post forthcoming sessions. Get Inspired! – Check out our short promotional video shot last year, plus a short photo montage. George Boxall and Tom Roberts win Inaugural British Speedgolf Pairs Championship! In very warm, humid conditions George and Tom completed their 18 holes in just over 41 minutes! Their Speedgolf score was 122:06. Not far behind was Chris and Jamie who took the best golf stroke score of the day shooting 79 in just shy of 48 minutes. The fast course played havoc with the short game but all who competed should feel very proud of their achievements.